This is a real fast rework of the official Metro Skin to get a bit closer to Windows 10's look. It should be fairly complete, I think, and be quite a close match to the official look. If I forgot to theme something just say so and I'll try to change the forgotten color setting . All credit goes to to the original author of Classic Shell and the Metro Skin, Ivo. Last edited by randm on Mon Dec 19, 2016 12:37 am, edited 5 times in total. The right side icons don't seem to have the option to show for this skin. Is there some sort of tweak that needs to be done to get them to show? The right side column shows all icons at once only in the Classic with two columns style. For Windows 7 style, you get 1 icon in place of the user pic of the currently selected item. 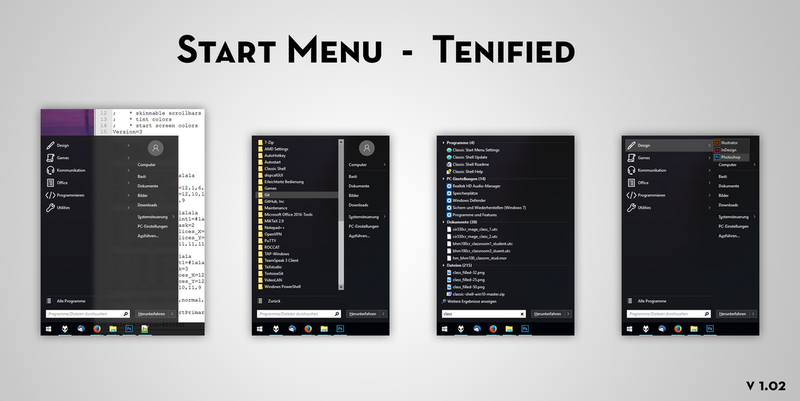 Scrollbar transparency is calculated from whatever is behind the start menu, as opposed to all other transparencies, which are relative to the (already transparent) start menu background. Which means a scroll bar transparency of 0 will just show the your wallpaper or whatever, while a button with transparency 0 will look the same as the start menu background (see e.g. the shutdown button below). For the new version 1.03, something wonky. Only get white default menu (skinless). Maybe needs a bitmap mask for main two sep? Yep, the scrollbar transparency got me confused for awhile, on skins I modded. Even worse headache is if glass blur option is turned off. Transparency/glass color goes different. There is probably exact math to it. I had to wing it on mine. Only Ivo knows the equation. for glass color on, and glass blur off. Last edited by juniper7 on Mon Dec 19, 2016 1:06 am, edited 1 time in total. Hm, something went wrong with the final refactor I did yesterday and I didn't test it properly :/ Anywys, thanks for notifying me, should be fixed now (kinda -- the code is super messy now ). All Program sub-menu can also be transparent? Why, oh why did you stop supporting the opaque feature? Because the text rendering looks much better with it enabled, without it, text looks blurry. If I had to guess, I'd guess it's just a matter of having too many features to feasibly manage and maintain .___. Is there a way to get the submenus with translucent glass effect? Hi, I love this skin but how do I match the taskbar colour/transparency with the same colour as the start menu? Try messing with the "Override Glass Color" option. Thanks, I have changed the settings in the taskbar tab and it looks good now but the start menu right column is a bit small and I want it to be a bit bigger by using some of the space on the left column, how do I do this? You can make the right column wider by...uh...going to the "Customize Start menu" and adding an & sign followed by a bunch of spaces and another & sign at the end of one of the items in the list. It's more of a hack than a fix, but it works. It won't make the left column narrower, though...I don't even remember how to do that. Is there any way to thin out the left column? I don't have any long-named programs or folders in my start menu, so there's a lot of unused space. Also, make sure Large font option is turned off. Can you make this skin available as a .skin (regular Windows XP/2000 skin)? 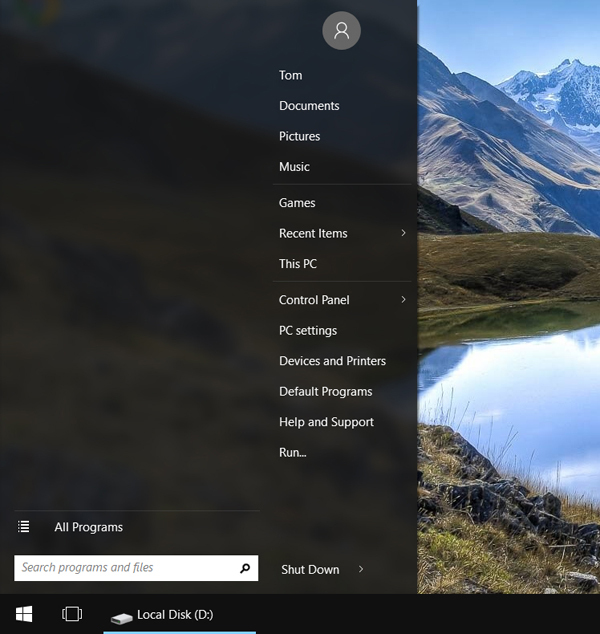 It looks great as a Windows 7 (two tiles) skin, but I prefer the single tile skin and Classic Shell doesn't seem to override the skin color on Windows 10 when set to Classic style (black menu background). that others have made that are similar to Tenified. just to have basic Classic 1/2 style. Copy Tenified-Classic.skin and paste in the skins folder. You might need to close or exit Classic Shell to get it to show up in the classic 1/2 lists. Like I said, it is crude way. There is no real caption band, and no user name. Would take a lot more additional text and modifying actual skin elements to get it all looking the best. You can take it from there. Yeah, I already tried modding it with Resource Hacker... Classic Shell doesn't seem to recognize the .skin file as a regular Classic/Two Column skin file... and yeah, I tried exiting and running Classic Shell again, it didn't make a difference. I used the Metro skin as a guideline (since it's available as a regular Single/Two Column skin), but I guess I should have read the guidelines for editing .skin files a little better... I'm fairly new at this . Thanks for the help . I will try and mod the file and post results . Yep, your mod basically did the trick . Again, thanks for the help . I'll try and mod the icons and some other things as well. BTW, it was a mistake on my part that the edited skin file I used (the one that I previously modded) wasn't recognized by Classic Shell. The reason was... it wasn't there . I forgot to run Resource Hacker as an Administrator in order to save the file in Program Files. The funny thing was, it didn't give an error when trying to save it to the Classic Shell installation folder and I never checked to see if the file was there so... . Hey, these things happen . An one other thing. I didn't know this, but Classic Shell doesn't seem to like underscores in the file names of the skins. On the other hand, It doesn't seem to mind to have spaces in them . Anyway, I'll either stick to spaces or dashes in the file names and save the files to the desktop first and copy them to the Skins folder afterwards . Glad you are getting the hang of it. There have been a few ticked off skinners who got errors in their file. before I copy over to CSM skins folder. Hmm, I never used underscore. I'll stay away from using that. Thanks.